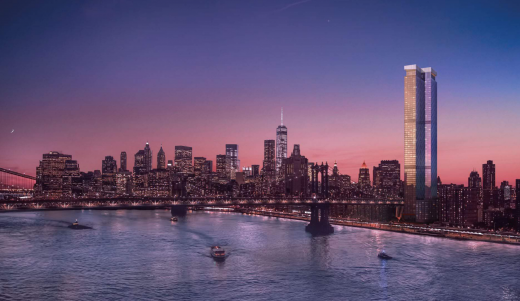 The company clearly has a thing for erections — it’s also behind the One57 tower uptown, commonly known as the “Billionaire Building” and this skyscraper plans to reach 800 feet, towering over Manhattan Bridge. 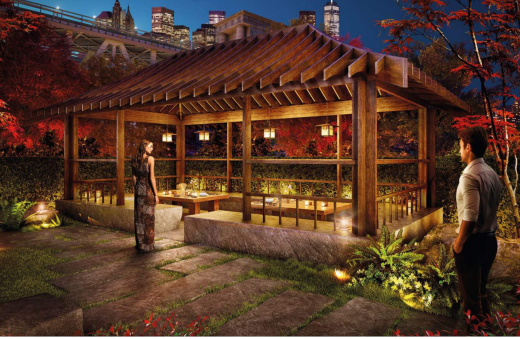 The top-shelf amenities at One Manhattan Square include well-tended garden mazes, a romantic fire pit and pagoda enclave, a couple of spas (one for humans, one for dogs), a bowling alley, a fully stocked cellar bar, and “the best private sports club in Manhattan.” For the kids, there’s authentic luxury teepees, tree houses and wacky slides. In October, Gary Barnett, president of Extell Management, told Bloomberg that the company will begin apartment sales exclusively overseas early next year, in China, Malaysia and Singapore. So it makes sense the brochure, first noticed by The Lo-Down, was published by Jones Lang LaSalle Inc., a firm based in Singapore hired to market the building in Asia. 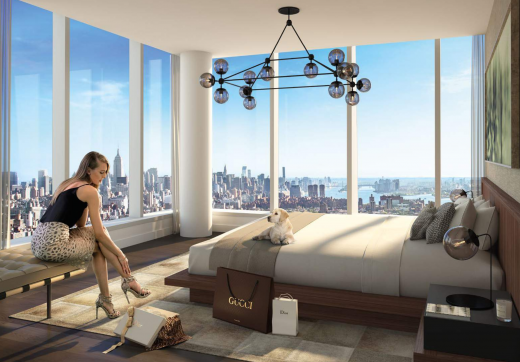 Barnett said apartments will be priced in the $1 million to $3 million range, to answer demand for a “good value” from rich buyers suffering from China’s currency devaluation and looking for a stable foothold in New York. 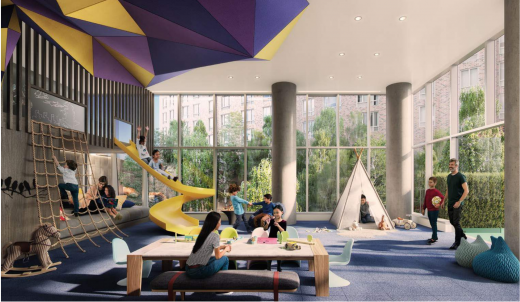 One Manhattan Square, already under construction, will enter an area heavily populated by low-income residents. Its neighbors include more than 20 public housing buildings. Members of the coalition argue the new high rise, which takes over the site of a former Pathmark supermarket, will distort shops and services towards those willing to pay top dollar and increase income taxes in the area, eventually displacing long-time residents. Extell’s plans for 80 stories take advantage of an area with few restrictions on development or height limitations. In 2008 a rezoning plan implemented height restrictions in the East Village, but Chinatown and the Lower East Side were not covered. The latest records also indicate that Extell is planning to develop a separate 13-to-17-story affordable building on the back lot of the property, facing Cherry Street, to stay in line with the 421A affordable housing tax subsidy. But the company hasn’t released any recent info (or images) on this. Extell will meet with residents in the area on December 15 at 6:45 p.m. at the Manny Cantor Center, as “part of ongoing meetings with the community,” according to a PR representative for the company. Trying to stop this development, the community coalition has been pushing the city to adopt the Chinatown Working Group Rezoning Plan. Fong says the plan would protect the entire Chinatown and Lower East Side area against buildings like One Manhattan Square, through height restrictions and measures to preserve NYCHA housing and local businesses. This Saturday they will hold a town hall at Seward Park High School to advocate for the plan’s adoption, inviting Mayor Bill de Blasio to attend. Though de Blasio came to office on a platform to defend affordable housing, community leaders say they are disappointed with his lack of support for their rezoning plan. In the meantime, click over to the brochure and be prepared to let your jaw drop.